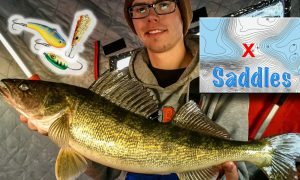 #Fishheads Nick Schmautz and Ben Graham make the trip down from Winnipeg several times each season to chase giant Rainy River sturgeon. 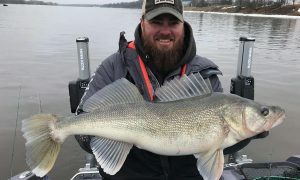 Did you know there’s a place in Minnesota where you could catch a 100-lb fish that’s over 50 years old? Dinosaurs do exist! Each spring massive sturgeon migrate from Lake of the Woods into the Rainy River to spawn. Hooking up with one is easier than you’d think — just hope your forearms are up for the fight. Sturgeon relate to the deepest holes in the river. That depth will vary from 15-30’ depending which section of water you’re on. Some of the best sturgeon fishing all spring long is within a couple-minute boat ride either direction of Border View Lodge. In fact next time I’m going to see if I can catch one right off the dock…. 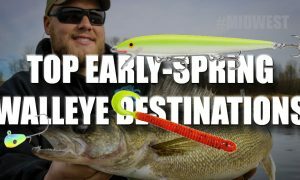 Position your boat on the up-current side of the hole, sometimes called the “head of the hole.” This area seems to hold more active fish as they funnel upriver, following the contour lines right to your bait. If you’re not catching anything: move onto the next hole! For me it’s 45-ish minutes of no action and I’m pulling up anchor…or making my buddy Jason Rylander pull it up lol. Position your boat on the up-current side of the hole. 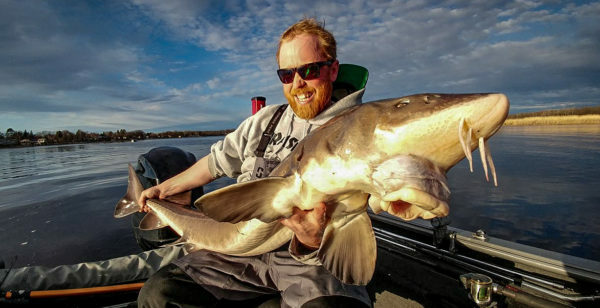 Sturgeon fishing is off limits on the Canadian side of the river. Make sure to pay attention to where the border is on your GPS — it will usually show up as a thin red line near the center of the river channel. 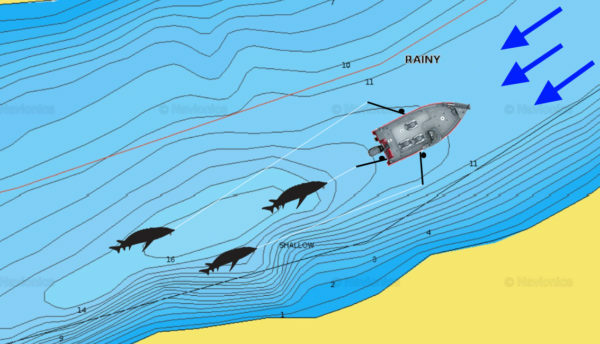 If you don’t have a mapping unit, simply stay on the inside of other boats. 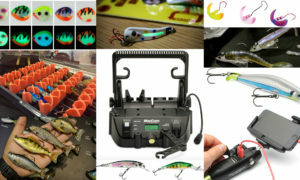 Pitch your rigs downstream into the hole, with each person letting out varied lengths of line and tossing out at different angles. Try to keep everyone’s rigs spread out as best you can, though the current will eventually pull them all back to center. Pay attention to which rod keeps going off and where that bait was positioned. Some days you’ll notice more fish coming from in the bottom of the hole, whereas other days they could be up on the edge in shallower water. 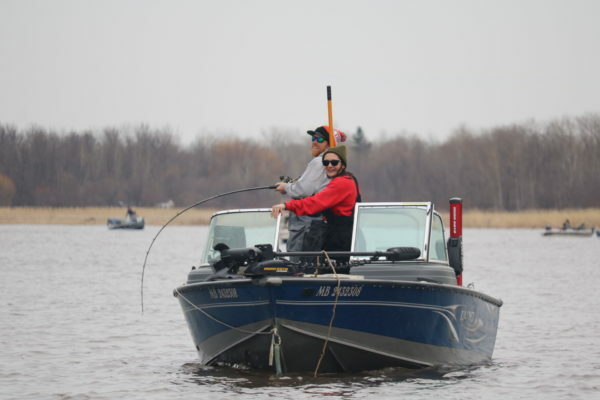 Don’t be surprised if one person in the boat gets the hot rod — sturgeon will sometimes follow “trails” along the river bottom, similar to how deer go through the woods. Hopefully you chose the right side of the boat to sit on! 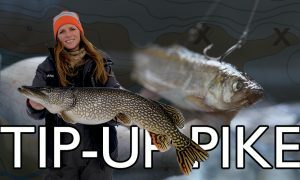 That’s why sturgeon fishing is one of the only times you hear of guys being okay with handing off “their” rod on a bite…or they just don’t want to admit they need to let their arms rest after the last one. Adding a small blade can help sturgeon track down your presentation in muddy water. 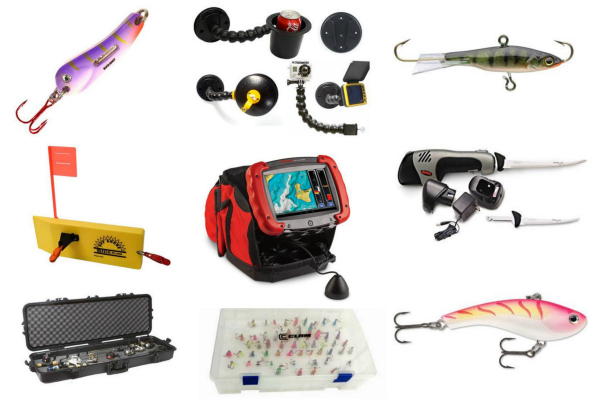 Don’t risk using gear that’s too light because A) you probably won’t land the fish and B) fighting sturgeon for too long could stress the fish out to the point that you risk killing it. A stout catfish or musky rod spooled up with 65-lb Sufix 832 Advanced Superline will do the trick. 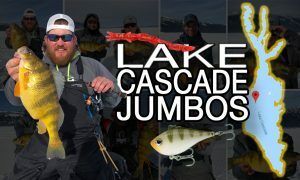 It has the strength to muscle in these modern-day dinos, yet the 17-lb diameter still does a good job of cutting the current to keep the bait down. You can get by with using the same superline for your leader, but I prefer to run 60- or 80-lb Sufix Fluorocarbon Invisiline. 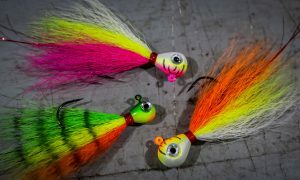 Not because I’m worried about them seeing it, but because fluoro has just enough stretch to absorb a bit of the shock to keep the hook from tearing out. When making rigs the night before a trip, I’ll tie ‘em up with a snell knot. If I’m throwing them together in the boat, I like to use what’s called the spangler knot because it’s cold-fingers and bumpy-boat approved. The best leader length can vary, but usually around 18” is a good starting point. 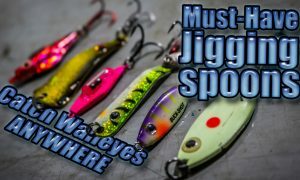 If the current is really ripping — or the fish are hugging tight to bottom — try chopping your leader down to 6-10″ to keep your offering closer to bottom. 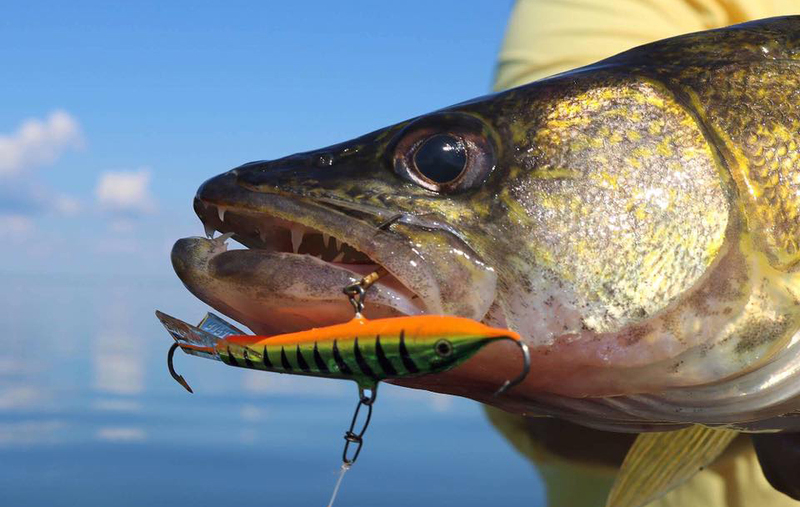 Play with longer 24-36″ leaders if you’re seeing the fish come through high on your electronics, but not getting bit. No-roll sinkers are a must. They’re shaped like a pancake which helps to keep ‘em from rolling in the current and getting you into a snaggy situation. A 3- to 5-oz no-roll sinker (depending on current speed) is usually enough weight to keep your presentation pinned to the bottom. 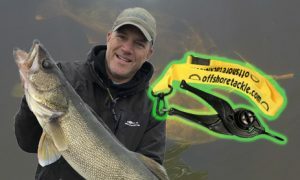 A 5/0 VMC 7384 Sport Circle Hook has a large-enough gap to load it up with bait, yet it’s not too large that you’ll sacrifice bites. 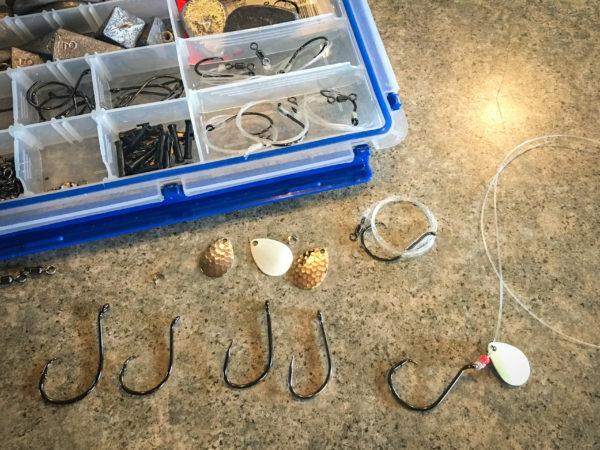 Circle hooks help keep fish pinned and are less likely to gut-hook the fish…something you’ll for sure appreciate when hanging over the edge of the boat trying to unhook a 5-ft dinosaur that’s thrashing in the net. 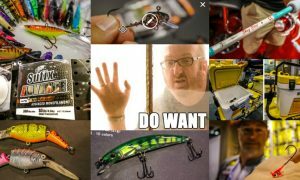 Don’t swing for the fences on the hookset like traditional hooks…sorry bass guys! 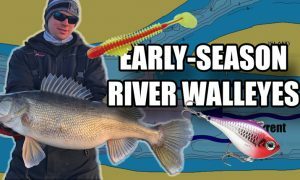 Instead, pick up the slack then start steadily reeling while sweeping the rod tip upriver. 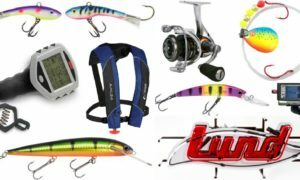 The circle hook will slide into the corner of the fish’s mouth and whammy — it’s game time. Nick Schmautz hooked up with a sturgeon longer than Lee Spence is tall. Sturgeon are great at feeding by scent, so make sure to frequently re-bait. I like to put on fresh meat about every 20 minutes to keep that scent trail strong. 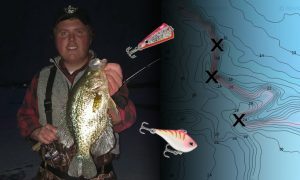 Load your hook with a glob of 3 or 4 nightcrawlers at a time. 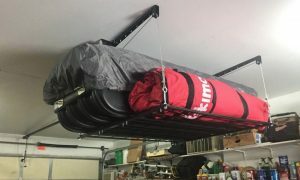 Make sure your ‘crawlers are packed in bedding if you plan to travel on the Canadian side of the river — they don’t want any of our dirt up there! Don’t have time to dig up your own ‘crawlers? Windsor Wholesale Bait let’s you order nightcrawlers online to be shipped straight to your door, and the cost is about 1/4 of convenience store prices. Some guys – *cough* me included *cough* – swear by adding a couple frozen shiners to the glob of ‘crawlers. It’s tough to tell if it makes a big difference, but catch a couple of bigguns while using ’em and you wouldn’t want to switch either! 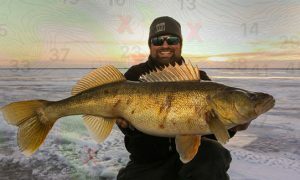 Swift current has a tendency of stripping bait clean off the hook – especially those frozen emerald shiners. 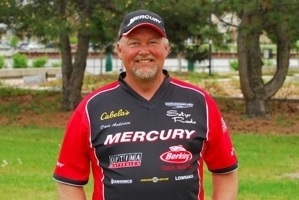 Using Bait Buttons (a small rubber “button” that slips over the hook barb) helps to keep your bait in place. They pay for themselves after just a few trips out. Don’t worry – your buddies will stop making fun of you once they get a chance to try ’em for themselves. Amanda McComas with sturgeon #4 on the afternoon. 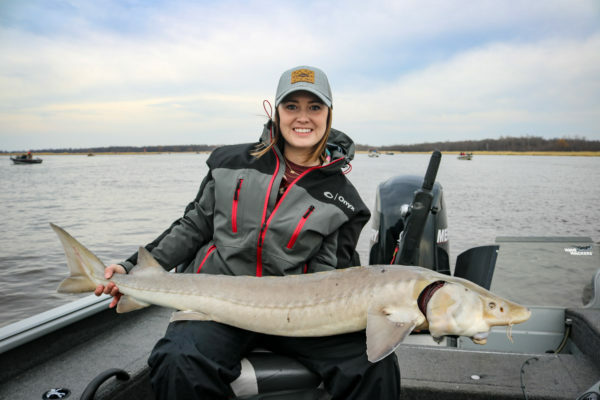 There’s no controlling the weather and how it impacts fishing, but luckily sturgeon aren’t as fussy as other fish when it comes to changes in river conditions. Which is exactly how I got hooked on ’em in the first place. 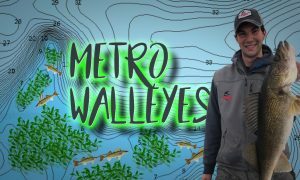 A few years ago a buddy and I were heading up to the Rainy River to chase walleyes when we heard that the water clarity had dropped from a few feet to just a few inches. An emergency pit stop resulted in a couple of cheap sturgeon sticks (aka catfish rods) which ended up saving the weekend. Didn’t know at the time that they would also start a new addiction for chasing these prehistoric river monsters. That said…curling up next to the fireplace and watching the hockey game back at Border View Lodge isn’t a bad option either when Mother Nature doesn’t cooperate. I’d be lying if I said we didn’t take advantage of that fireplace one rainy afternoon with a game of Sequence lol. Can’t wait to make it back up. 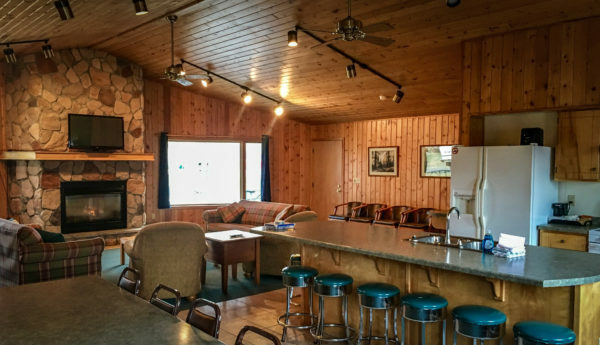 Border View Lodge is located 12 miles north of Baudette, MN at the mouth of the Rainy River.